A little barbeque now and then is enjoyed by everyone.The winter approaches, the sun gets cooler, and the backyard invites you. Everyone with a love of smoked meat in their heart feels like heating up the barbeque too. After all, it’s so much fun gathering friends and family for a sunny backyard get together or an evening garden party. But, before we start it is always better to keep few things in mind so that the meat cooked is actually worth the efforts. The plain fact remains that the outdoor cooking shouldn’t taste like indoor cooking. 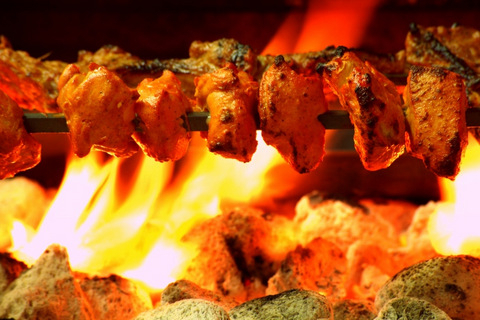 The characteristic taste of barbeque comes from the fragrant fumes of slowly burning hardwood or charcoal. At the same time using a right marinade to tenderize & flavor the meat is also essential. Marinade is a combination of acids, oil and spices. The acid is used to help break down the meat, the oil is used to keep the meat from drying out, and the spices are used to add additional flavor to the meat. However you need to make sure that you do not keep the food in marinades for too long. Surfaces in direct contact with a marinade can become soft and mushy, not something you would want to serve. This is particularly important with seafood, which can actually cook, in an acidic environment. Whether it’s a steak or a chop, tenderness and texture is also associated with the quality of the meat. I personally believe that a little bit of planning can take a perfectly nice meal outside to the next level and make it a truly memorable event. While the grilled meat remains the evening attraction, side dishes are important too, especially if you have vegans in the group. Take advantage of seasonal vegetables to prepare amazing salads which goes really well along with brazier food. Feel free to share some chilled beers .